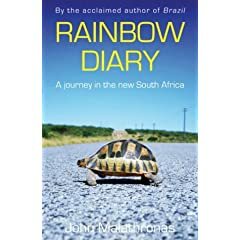 Software uses US measurements, but the OS is in metric..
Hi John, I just wanted to let you know that I'm reading Rainbow Diary, which S**** bought me for Christmas ! It's a really interesting contrast with my experiences out there and in Zimbabwe in 1984/5/6/7. Like I say a great contrast though. I went out in the middle of "sanksies" to see for myself and make a bit of money whilst I explored the railways there at company expense :) Sub-contracting from my UK employer cost SA about quarter of a milion pounds, that was 1M Rand at the external exchange rate but it deprived business of 2M Rand worth of foreign currency allowance at the official forex accounting rate (half as much as the other, and used for any corporate deals). A complicated economic sanction, but I decided to take the job as I strongly believe in seeing and forming my own opinions on contentious subjects. Amongst my closest friends in Jhb were a big bullet shaped black man called Simon D***, with an amazingly lazy but humorous laugh and a Chinese bloke called Paul F***. They were both travelling technicians with ICL Retail Systems, staffed by a mixture of ex-pats, Afrikaners and anyone local who was relaxed and relatively liberal :) We three used to sit on the grass at lunchtime with a monkey gland burger in front of City Hall in jacaranda filled Braamfontein and swap bitingly cynical jokes at the racist system. Even then the richer suburbs of Jhb were defended to the hilt with walls, electric gates, lights, dogs and armed response signs. Simon had been banged up one New Year for leaving his dompass at home, and had to be bailed out by management on NY Day. Paul was worried that the Coloureds and maybe even the Blacks would get at least the 1986-7 partial vote before the Chinese, overtaking the long-delayed Chinese voting negotiations. Had some great Chinese dinners at his home. Remember this was before the crackdowns and necklacings, they weren't unknown but it wasn't a reign of fear then. Everyone always had a smile and a "yebo" for the black security guards and asked after their families. For my second long trip there I lived in a flat in Hillbrow, just round the corner about two streets from the Rotunda. It certainly wasn't a war zone, it was cosmopolitan, liberal, had great book and record shops, clean buildings around greened squares, half a dozen restaurants on every block, not to mention Johannesburg's last electric trolleybus route. It also had a great scene. I never got to go in any of the clubs (still a bit timid) but I walked past many evenings and heard the African jazz, which I was really into at the time. I didn't go into a township either - I hated the idea of turning someone's suffering into tourism - but they were a fact of life for anyone who travelled by train as much as I did. When we passed through them, official or unofficial, neat railway township or squatters camp, as we looked out of the window - First Class, Second Class, Third Class Bunks, Third Class sitting, and in Zimbabwe Fourth Class - we were all the same as them. The black community itself though oppressed was also a fact of life and the underpinning of the country's economic success. I'm glad it's more liberal and equal but wish everyone didn't have to lose their livelihoods. In Zimbabwe the entire black middle class still supports a community of black maids, shop assistants and gardeners, there's no shame seen in it. I did PE and George/Knysna in the same long weekend on a triangular air trip, with steam at each corner. I haven't done the scenic Montague Pass by rail yet, but special trains do tackle it from George or even Mossel Bay and take the western Garden Route to the top of the pass to Oudshoorn. You could cycle down :) You can take a "power van" motor rail trolley from Oudshoorn up the Outeniqua, the old Eastern Cape main line, and back down again, downwards is the route you cycled. And another little power train at some times of year from Oudshoorn along the old branch line to a hotel in Calitzdorp, which I think sounds much easier than cycling ! Durban and Zululand I also loved a lot! As you say luxury there is so cheap and I liked that I could just walk into a sea front hotel and pay my bill cash in advance - only money to keep was for spending. Warm sunny and cosmopolitan with a great beach (and shark nets, you didn't swim before breakfast following a storm), I brought back some nice little railway related bits from antique/upmarket flea shops on the road from the station to the sea front. Glad to hear the snake farm is still going well ! I loved the South Coast from Durban too, the wooden electric slam-door train over the beach-front lagoons and causeways to Kelso was really beautiful (which back then went onto beach resort of Port Shepstone and another narrow gauge steam train through the sugar cane and rondavels of the Valley of 1000 Hills). On other visits I explored the railway route through Tzaneen and down the edge of the Kruger park, and we drove across the Escarpment and battlefields of Zululand - an area that still tugs at my heart almost as much as the 1000 Hills.